When considering the British Invasion of the early 1960s, a band that is sometimes forgotten but should not be by virtue of their hits and wonderful melodies is The Zombies. Formed in London, The Zombies developed their sound thanks to Rod Argent’s organ and piano and Colin Blunstone’s unique vocals. Their first of three hit singles came on their debut album in 1964 with “She’s Not There”. The second hit is 1965’s “Tell Her No”. The third hit, generally considered their best known, is “Time of the Season”, which appeared on 1969’s Odessey and Oracle. 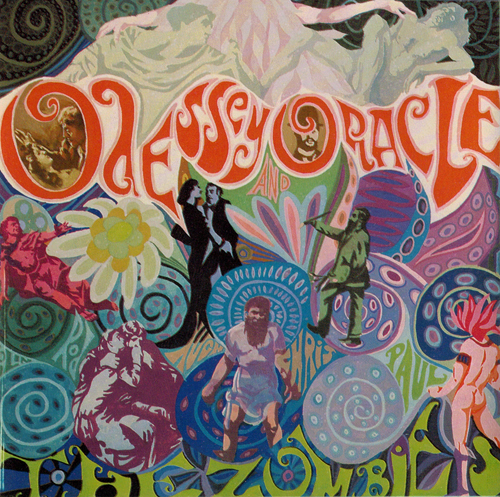 The Zombies released Odessey and Oracle in 1968. Given the release date, the album takes on a bit of a psychedelic character and represents a departure from the band’s earlier efforts. Interestingly, the album was largely overlooked until “Time of the Season” was released as a single in 1970. Sadly, The Zombies had broken up by then. On the plus side, the popularity of the single gave the album a heightened status, and over time, the remaining 11 tracks became appreciated by classic rock enthusiasts. Odessey and Oracle is now considered a gem of the psychedelic rock era. As such, the album has been issued and reissued many times on CD over the years, in all major markets. Here, we consider the original U.S. CD issue. Odessey and Oracle was first released on CD in the U.S. in 1987 by Rhino Records under catalog number RNCD 70186. This version offers 14 tracks, with “I’ll Call You Mine” and “Imagine the Swan” tacked on at the end, therefore after the original 12 album tracks. Collectors looking for a Japanese or West German pressing will not find one for this Rhino issue. By 1987, most CDs intended for the U.S. market were pressed domestically, as a number of pressing plants had opened to meet the rapidly growing demand. For Odessey and Oracle, the first copies were pressed in the U.S. by LaserVideo. The disc sports a red coating with black text with a black outer ring, along with the Rhino logo in aluminum characters “cut out” from a black coating. The disc label does not actually state where it was produced, but its origin is revealed in the mirror band. There, one finds the text “MANUFACTURED IN U.S.A. BY LASERVIDEO INC.”, typical for this pressing plant. The disc is also undated, but the back insert is dated 1987. There is no barcode on the back insert. Despite the popularity of Odessey and Oracle, the original Rhino issue is surprisingly hard to find in my experience. Shown below is the cover and back insert for this Rhino release, along with the LaserVideo pressing. 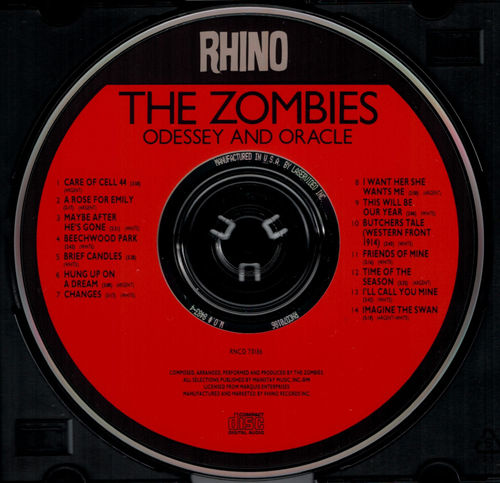 The cover for the original U.S. issue of The Zombies Odessey and Oracle (Rhino, catalog number RNCD 70186). This is the standard cover artwork for this album. The back insert for the original U.S. issue of The Zombies Odessey and Oracle (Rhino, catalog number RNCD 70186). It is dated 1987 along the bottom, and there is no barcode. This release contains 14 tracks, with “I’ll Call You Mine” and “Imagine the Swan” included as bonus tracks. The U.S. LaserVideo plant pressing of The Zombies Odessey and Oracle (Rhino, catalog number RNCD 70186). 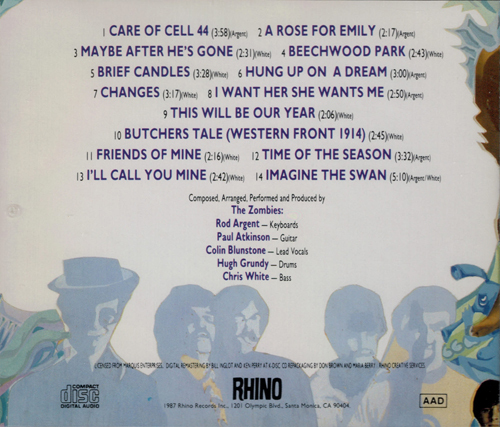 The label design is typical of U.S. Rhino releases from the late ’80s. Although the disc label does not state the country of manufacture, it has “MANUFACTURED IN U.S.A. BY LASERVIDEO INC.” stamped in the mirror band.